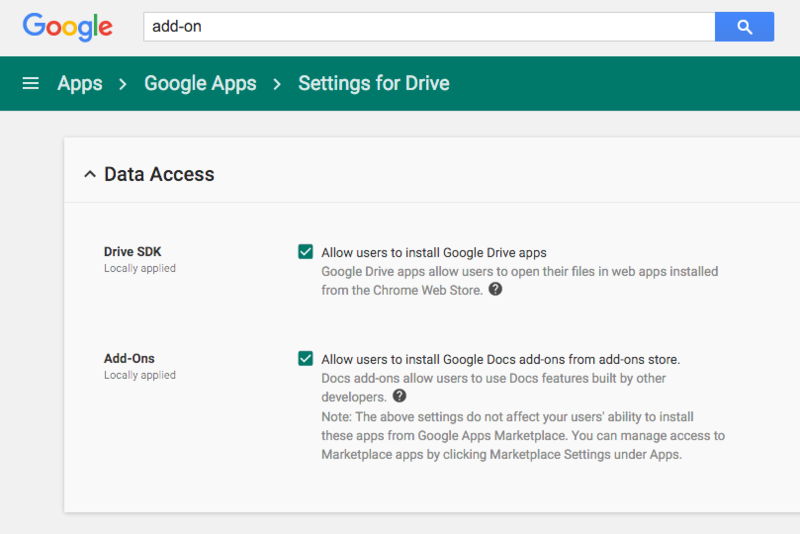 Here’s how they can enable add-ons for your Google Account from the Google Apps admin dashboard. Step 2 – Go to Apps -> Google Apps -> Drive and make sure the status is “ON” for everyone. Step 3 – Go to Apps -> Google Apps -> Settings for Google Drive -> Data Access and enable the following settings. Google Drive apps allow users to open their files in web apps installed from the Chrome Web Store. Docs add-ons allow users to use Docs features built by other developers. The Admin console setting for add-ons controls Docs, Sheets, and Forms; there are not separate settings for each document type.